After doing some research, I still think the government went too far with the censorship over the fugo attacks. But the problem of censorship and the public’s right to know isn’t that cut and dry, as the events surrounding the fugo story demonstrate. While the government was concerned about panic and fear, it had another reason to keep any fugo incidents out of the print and broadcast media: it didn’t want word to get back to Japan how successful the long-range balloon launches had been. If the enemy learned that the balloons had done some damage, he might be encouraged to send even more. As I had commented in my previous post, there seems to have been some awareness of the fugo threat before the government opened up and informed the public at large. On May 5th, 1945 a minister in Southern Oregon was with his wife and some children from his church on a picnic. His wife and the five children were in the woods, shouting they had found something that looked like a balloon. Apparently his wife and the kids were unaware of the danger. He had heard of the Japanese balloons. He tried to warn them but it was too late: one of them touched the fugo, causing it to explode, killing all six of them. The minister was unharmed, beyond the reach of the blast. At the same time the government would still hold back details about where and when each balloon was found and its effect. This specific information would be kept from the enemy so that he couldn’t use it to take corrective measures. Now this was a reasonable compromise. Citizens would be wary if they encountered one of the unexploded balloons and also would know to contact the authorities. Due to the strict censorship, one boy was unaware of the danger from a “plaything” he had found from a landed fugo. An article from The News Tribune in Tacoma, Washington, dated August 15, 1945, described how the small boy picked up an anti-personnel bomb. Since the device resembled a small airplane, he wound up its “propeller” –- in reality arming it. He was one-sixteenth of an inch from being blown up. Time to correct the record – that is, my record. Jim did a good job excerpting my letter. There’s no problem with him misquoting me or taking what I wrote out of context. The problem is with my memory and my lack of fact checking. There was indeed an incident during World War II involving a lethal detonation from a fugo bomb-balloon that had drifted into the United States from Japan. A Google search revealed six people were killed, not one person: a woman and five children. The website, http://www.stelzriede.com discusses the incident and reproduces the text from World War II era newspaper articles about the fugo threat. An article dated June 1st, 1945 -- headlined “Saw Wife and Five Children Killed by Jap Balloon Bomb” (I know, “Jap” is an offensive term but that’s the headline) –- explained that a minister was the only survivor during a church picnic when a fugo exploded in Southern Oregon back on May 5th. Details of the tragedy were given. While the minister was by his car, his wife and the five church children were in the woods. They shouted to him that they had found something like a balloon. The minister, Rev. Archie Mitchell, was quoted: "I had heard of Japanese balloons so I shouted a warning not to touch it. But just then there was a big explosion. I ran up there -- and they were all dead." So it appears that the government had made some limited warnings about the fugo balloons since Mitchell knew about the danger. Or that the story got out anyway. Whatever the case, officials decided to expand their warning program after the tragic picnic incident. Schools would be closed for the summer; more kids would be outdoors who might stumble upon one of the balloons. This leads into the topic of secrecy and the public’s right to know. A topic for another fugo-related post. I found the two glossy cards seen above at a downtown coffeehouse. As an ex-Catholic these remind me of prayer cards depicting various saints. I’ve got nothing against Carl Jung; somewhere in this rambling mess that dominates my apartment is a copy of FLYING SAUCERS: A Modern Myth of Things Seen in the Skies. But the photos used on the promotional cards are so reverential that -- at least to my jaded mind’s eye -- they smack of religiosity. I hope that after I shed my mortal coil that people won’t idealize me, promulgating all sorts of hagiographic works. 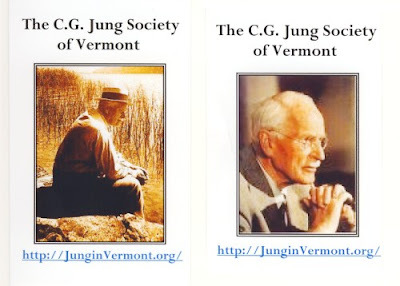 On second thought, maybe I shouldn’t worry about that at all, especially with the devout Carl Jung followers in Vermont. 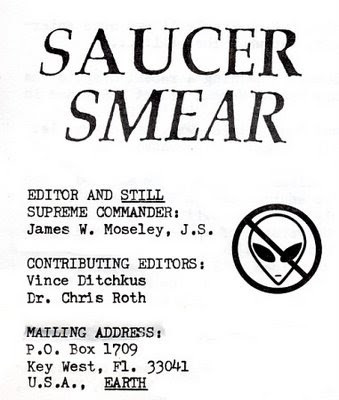 …to Jim Moseley, writer-editor of Saucer Smear. Apparently his zine is the oldest UFO publication in the world. Dennis Plunkett of the British Flying Saucer Bureau confirmed this unique status in a letter to Supreme Commander Moseley. Plunkett stated that the BFSB no longer published a magazine, leaving Moseley with the honor. ..or why haven’t I been posting lately. I’ll skip over the health issues, except to say I have a limited amount of energy, especially of the creative kind. One distraction was my website. I wanted to upload a PDF file of the latest issue of my print zine. The link wouldn’t work. Also, others links were broken/bad. I tried fixing them but nada. After three phone calls to the company hosting my site, it turned out the program I was using to create web pages was adding extraneous info, detailing where the file was located on my harddrive. Previously I had used Mozilla Suite with Composer but when cleaning up my drives I deleted it. Composing web pages with Netscape Navigator 4.5 wasn’t cutting it. So I went back online and discovered that the only way I could get Composer was to download Sea Monkey. It took a while to do that with my dial-up connection. Anyway, the website links are fixed and the PDF file is up. Hours wasted just to get to that point. I’m wondering if the effort was worth it because there isn’t that much activity at the website. If the site had been busy someone would’ve emailed me to let me know about the bad links. So I’ll let the site sit there and see if it generates any interest. Of course, there’s always reading, reading, reading to distract me. From the detailed research at The X-Spot, to the Thoughts of an Angry Old Woman or the digressions of Doug, and all the other blogs I follow – sure, I could be blogging but I get sick of hearing my own voice all the time. I need to be exposed to other perspectives. Especially the Angry Old Woman. She gives me hope for my old age.